I want to thank you for this wonderful little orchid, I waited patiently everyday to see anything beginning to bug. Right now it is in full bloom, I never saw anything so beautiful. Thank you, I am so happy. I transplanted all my other orchids into your hydro pots & so far so good. I had an old orchid just got done blooming, I am happier still. 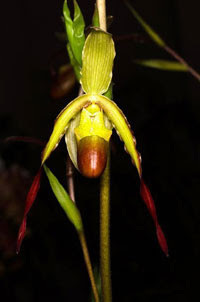 The other orchids are showing new growth, & I am following your instructions. I am so glad I found you. I won't be growing orchids in any other medium but yours. I just wanted to let you know that the orchids arrived safe and sound. My Colmonara "Bobcat" is starting to bloom and is beautiful. I am so excited to see the others in bloom. I also wanted to let you know that the Phalaenopsis (I-Hsin Pink Face X I Hsin Barbie) that had lost all of his roots when I did the transplant into the Hydropot is now giving me some extremely nice roots that I will have to make sure go into the pot. All my orchids that I transplanted are loving their new pots and I am so pleased to see that they are doing well. I honestly used to have a black thumb where they were concerned, but now I see that I can grow beautiful orchids. Thank you so much for all of your help! I will definitely be purchasing more orchids in the future. in the mean time another shoot sprouted and is taller than the first and has eight more buds! WILL IT EVER DIE! Should she now cut the first shoot back to the leaves? Also the Encyclia cochleata has had one bloom after another since Aug. I just wanted to send you a message. I just joined your Orchid of the Month club and received my first orchid. The first bloom has opened and it's spectacular. 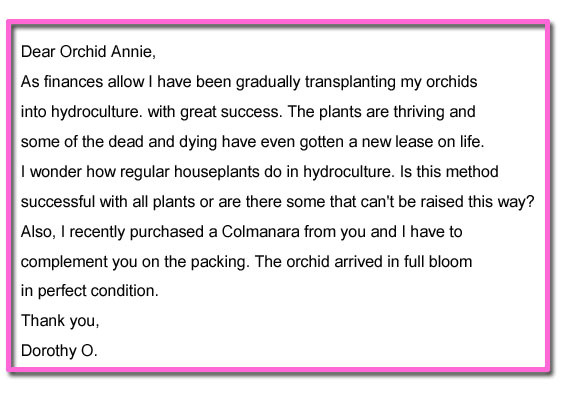 The plant was so secure upon arrival and was quite mature and healthy I was extremely pleased. I try to keep my orchids indoors, but they get some light just not too much. I recently ordered a grow light and should have it early next week to place in my dining room in a corner I have near a window (not much direct light comes in but the breeze/air circulation is what I'm mostly after) which should help to complete all the needs of the plant. 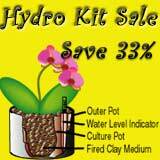 The hydropot provides correct watering needs and humidity, the window helps with air circulation and the grow light will provide the adequate amount of light to help maintain all my orchid babies. This is the first time I've tried using a hydropots for growing orchids and I must say, the three species that I transplanted into the pots that I ordered are very very happy. They've grown so much it's amazing. I never knew the impact that this type of watering/container could have on my plants. A few months back I had quite a large collection but little by little it got smaller and smaller. Some plants were not getting enough light and/or water so I've been keeping them outside and as they bounce back I've brought them back in. 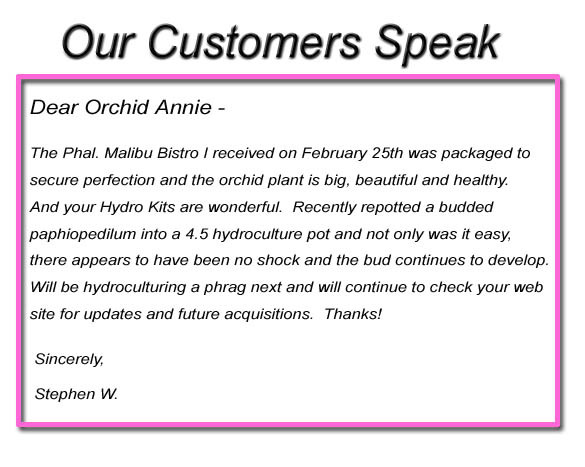 Now, I'll be sure to get hydro pots for all of them since I'm convinced that this it the ticket to long lasting healthy orchids. I'm so thankful to have found your site and product. I can't wait to get my monthly orchids it's like a little surprise every time....now I'm sure to have the best and unique orchid collection around. Thanks again!